Ever since I saw a crow repeatedly drop a walnut onto the street from its perch on a wire above, fly down to check it, pick it up and drop it again, I wanted to learn more about them. So I’m reading Crow Planet: Essential Wisdom from the Urban Wilderness, a sort of “how to” for amateur naturalists who want to explore nature where it lies (or flies) without having to journey out to Nature with a capital “N.” I learned that crows drop nuts on the road, hoping a car will drive over it and crack it open. The crow in the sketch above had been hanging out with some crows and a few squirrels on a neighbor’s front porch. This odd group was bickering over who got the peanuts and who got the walnuts that my nutty (pun intended) neighbor lady puts out daily (hourly?). When I showed up he took this more watchful stance. I used to dislike crows because they seemed to overwhelm the landscape when they showed up and their noisy caws drowned out the softer, sweeter sounds of smaller birds. But I’ve learned to appreciate these fascinating birds. Crows are helpful too, since as omnivores, along with plants, they eat insects considered as pests by gardeners, and enjoy fresh roadkill, thus tidying up the neighborhood. They are well-suited to our increasingly urban, concrete jungle, which is why their population has increased. It is estimated that in the U. S. there are as many crows as households—about one crow per family. If you want more information about crows, there is a good Crow FAQ here by a Cornell University professor who also seems to find them endearing, despite their usually undeserved bad reputations. Oh, I love this! I’d seen the book mentioned elsewhere and I’ve loved corvids for years. Here (Australia), the introduced cane toad is lethal to almost all other species (can cause excruciating blindness in humans and have been known to cause death in domestic pets and have wiped out so many native frogs), so when some people began to notice crows actually eating cane toads, scientists took notice. The super-savvy crows had figured out that the toxins were present only in the poison glands, not the body(edible meat part) so they learned to flip the toads and eat the abdomen. And I really like your crow sketch, Jana. Thank you so much for the mention of the book, I immediately went to the local library site and requested it! Crows have been an object of my affection and fascination for many years, for all the reasons you described. Some of my best artwork in past years had crows for a subject, in fact I had been thinking of revisiting that subject. Your sketch is full of expression. One of the great things about growing up on a dairy farm was that we had lots of pets, some wild. When I was ten at one point we had (besides cats, dogs and a pony) a wild fox, raccoon, and a crow. The rows was a hoot, clever, larcenous, and raucous. I’ve always loved them, complete with their shiny black plumage. Thanks for the video! Jana…this post was fascinating! It seems this will be the Year of the Bird for me. A friend gave me a copy of SONGBIRD JOURNEYS as a Christmas gift…we had agreed not to exchange gifts this year, but this was a book she’d already read and enjoyed, and thought I might too. Not a topic (how/why birds migrate) I would have be drawn to on my own, but am looking forward to it based on Julie’s recommendation. Then, last week, I stopped at an art gallery and saw WC paintings of birds by Beatrice Bork, which blew me away! Her watercolors are so vivid and lifelike! (She travels often to Trinidad and Tobago, which she considers Bird Paradise!) Now, your painting and info about the crow. Someone is trying to tell me something! That video was enjoyable…and your painting too! Thanks! When I saw you post this on FB my ears perked up because I have a friend who is like the north-of-the-border equivalent to this author and her birthday is coming up! I ordered it and started reading it then put it down (it’s not my book after all!) but will request a read after she’s done with it. Thanks, Jana! Sadly the link didn’t work. Is it a video your cat watching birds on TV? My cat sits in front of the TV and watches regularly, occasionally swatting at things. She was fascinated by flamingos yesterday. To me crows are scary. Aren’t they the ones that call out ‘never more’ in one spooky story by Poe? I like kookaburras best and I can’t get that silly song out of my head – Kookaburra sits on an old gum tree. See my latest post – more about the silly legal tangle about copyright. 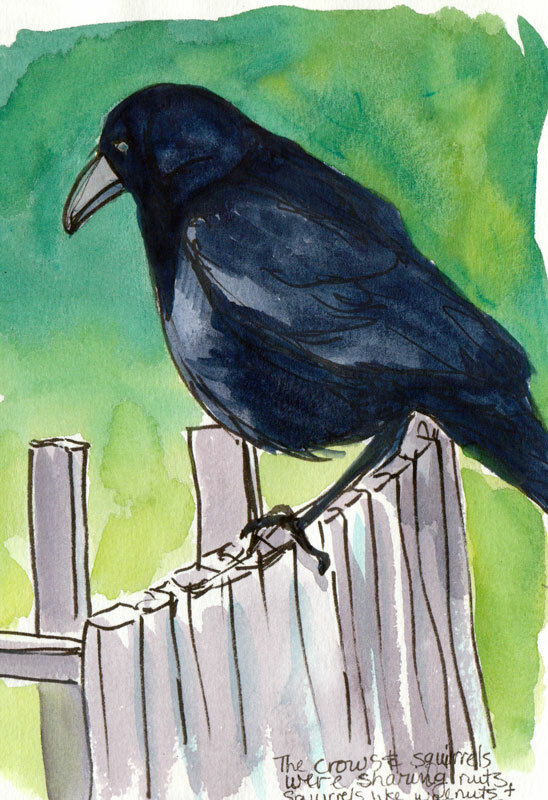 LOL…love this post and your crow painting! I was once stalked by some crows every time I went walking. I used to feed the squirrels and the crows would steal from them. I used to tell my husband, they have to be recognizing our faces! My husband try to shew them away and they started dropping things on us. Really enjoyed your sketch, post, and the crow faq you linked to. I have always liked crows and wish we saw more of them around here. In our area it’s the magpies that get the bad press, but they are also intelligent, playful and fascinating birds. Hello again, everybody. Love that crow–kind of a universal essence of crow, I think. Here in the highlands we have giant crows–often called rain crows–with much the attitude of Jana’s. A pair hang out at our local liquor store/7-11, and make a pretty good living there. Snow like we have now is a big problem for such big, hungry birds. We had communion at our church Sunday, and as usual I scattered the unneeded wafers over the lawn, for the birds. A bunch of crows waiting in a nearby tree raised a cheer, and I wondered if they had been waiting for this, which takes place first Sundays. That would be bright of them! Maybe they know something we don’t. Great sketch and story! I love crows. I think the story from the video was in National Geographic a couple of years back. Those crows not only use tools, in another experiment they MADE them by bending wire into hooks of just the right size. I personally observed some amazingly intelligent things crows did just watching them in their environment. I like how the crow in your sketch is fat and thoughtful – very dear! I had to come back to this post and tell you how much I love that book. It’s truly one of the nicest things that’s happened to me this year. Don’t you find that the “lectio” that she writes about, resonates with the practice of observation for painting? The whole book is a deeply beautiful meditation, much more than just a book about crows. What a treasure.